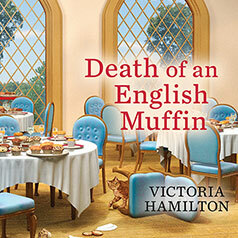 In the latest Merry Muffin Mystery from nationally bestselling author Victoria Hamilton, baker Merry Wynter returns with a fresh tray of muffins and a case that has authorities stumped. The Legion of Horrible Ladies, as Merry calls them, is led by the terribly nasty—and fabulously wealthy—Cleta Sanson. The abrasive Englishwoman keeps everyone whipped into a frenzy—until she meets an embarrassing end behind a locked door. Evidence reveals that Cleta was murdered, yet no one is privy to how the deed was done. Merry knows that she must quickly find the killer before another of her guests gets greased. "Death [of] an English Muffin was another good mystery in the Merry Muffin series. . . . [Narrator Margaret Strom] has a good voice for cozy mysteries." ---Books, Movies, Reviews! Oh My!